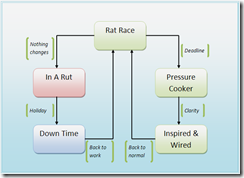 Typically, for me, everything is based around a default state of “Rat race”. If nothing changes for a log period of time I’ll enter the “In a rut” state the only thing that really breaks that state for me is going on holiday for some “Down time”. This gets me back into the “Rat race” state. 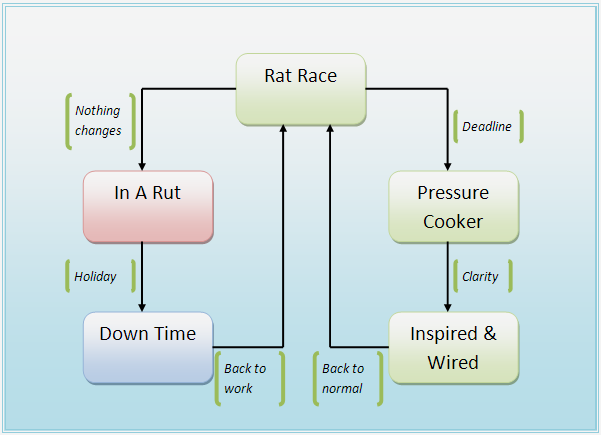 If, whilst in the “Rat race” state I come up to a deadline, I move into the “Pressure cooker” state. I don’t know if this is peculiar to me but it is normally from this state that i enter the “Inspired & wired” state. When the rush is over it’s back to the “Rat race”. This is a very generalised cycle and things may not always work like that. I may be in a rut and then come up against a deadline, or whilst having some down time I’ll have a flash of inspiration and come back to work raring to get coding.